Borders: Japan is an island nation in East Asia surrounded by the Pacific Ocean on one side and the Sea of Japan (East Sea) on the other side. Japan shares maritime (water) borders with China, North Korea, South Korea, Philippines, Northern Mariana Islands, and Russia. 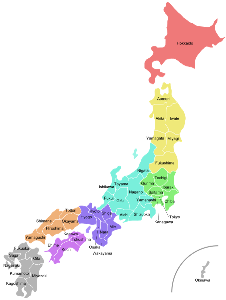 Divisions: Japan is officially divided up into 47 prefectures. The names and location of each are shown in the map to the right. It is also sometimes (unofficially) divided into eight regions shown by the different colors on the map. The largest of the prefectures by population are Tokyo, Kanagawa, and Osaka. The largest by area are Hokkaido, Iwate, and Fukushima. Description of flag: The flag of Japan was first adopted in 1870 (the current design became the national flag in 1999). It has a white background with a red disk in the center. The red disk represents the sun. The flag is sometimes called the sun-disk flag. In Japan it is called Nisshoki or Hinomaru. Hinomaru means "circle of the sun." Origin of the name Japan: The name "Japan" is an English word that comes from the Chinese pronunciation of the word for Japan. The Japanese name for the country is Nippon or Nihon. The words "nippon" and "nihon" both mean "from the Sun" and are sometimes translated as "Land of the Rising Sun."